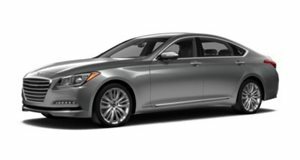 Hyundai’s new luxury brand Genesis is a big deal in the US. Not so in the UK, it seems. Autocar reports that the new Genesis G80 (still sold as the Hyundai Genesis in Her Majesty’s Kingdom) is now being pulled from the UK market. Selling only 50 units since 2015 is a pretty good reason why. So what went wrong? Its high base price, for starters. Hyundai offered a high-spec model only, and it cost at least 50,705 GBP. That's a hell of a lot of money for a Hyundai, even one at the top of the line. Compared to rivals such as the BMW 5 Series, Jaguar XF, and Mercedes-Benz E-Class, the Genesis actually carried, at times, a higher base price, and, not to mention, fewer options. The other issue Hyundai had is the fact that sedan sales (globally, in fact) are on the down turn. The Genesis brand was expected to arrive in the UK for 2018, but it appears that’s been delayed as well. Genesis is currently putting the finishing touches on its upcoming BMW 3 Series rivalling G70, and assuming Genesis comes to the UK at all, that sedan will likely be better suited for that market. In addition, an SUV is also in development, which will definitely help Genesis sales in all markets where it’s sold. SUVs, especially premium luxury ones, are hot right now and we’re surprised Genesis didn’t launch one from the get-go. With the Hyundai platform pool to choose from, that shouldn’t have been a problem. Nevertheless, there are still just 50 Hyundai Genesis sedans driving around the UK right now, and that alone is a tell all sign that Hyundai/Genesis needs to seriously reconsider its branding strategy, in the UK at least.